I have decided to do away with my European Warmbloods section and just add them to my American Warmblood section. These are the foundations of my A.WB breeding. If wanting to breed a purebred foal from any of the Warmbloods, please remember the naming scheme. Thank you. Sin'dorei-1976 bay Dutch Warmblood. Sired by Lector (r), out of Landy (r). Promised Elegance-1976 dark bay Dutch Warmblood. Sired by Lector (r), out of Iana (r). Bred by Shadow Wolf Stables. 1995-Nu Promis, dark bay filly (x Rampal -r) o/b Shadow Wolf Stables. 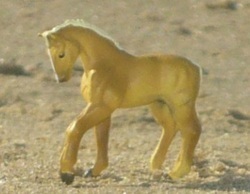 Teya-1977 bay Dutch Warmblood. Sired by Lector (r), out of Landy (r). U-Boat-1978 bay Dutch Warmblood. Sired by Lector (r), out of Landy (r). Synful-1979 chestnut roan Trakehner. Sired by Insterfeuer (r), out of Syggi (r). 1995-Synlicious, chestnut roan sabino filly (x Takoda) o/b Shadow Wolf Stables. Vira-1979 bay Dutch Warmblood. Sired by Legaat (r), out of Nareina (r). 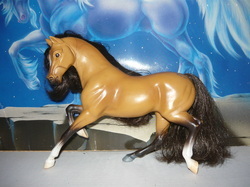 Pegasus' Moon-1986 Classic champagne silver Morgan/ASB mare. Bred with the help of Shadow Wolf stables. Sired by Persuader (morgan), out of Shafers Sister Moon-r (ASB). Currently a bso. 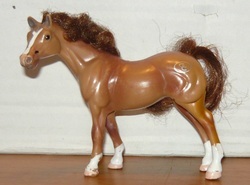 Pegasus Of Skyrim-1991 silver bay champagne American Warmblood. Sired by Nepoleon-r (Swedish WB), out of Pegasus' Moon-bso (Morgan/ASB). Currently a bso. Gambling Lady-1991 black splash American Warmblood. Sired by Furthermore, out of Miss Gambling Moon. Bred by Shadow Wolf Stables. 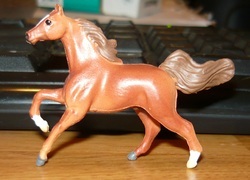 Geyser-1992 bay Trakehner. Sired by Onassis (r), out of Gemuetlichkeit (r). Kira-1992 bay Budenny. Sired by Kabotag (r) (TB), out of Dekada (r). Bred by Shadow Wolf Stables. Also spelled Budyonny. Pronounced Bood-yaw-knee. Winterspring-1993 dark bay/brown Hanoverian. Sired by Warkant (r), out of Linares (r). Warkhant-1994 black Hanoverian. Sired by Warkant (r), out of Alke (r). CM unknown brand, will be painted by me. 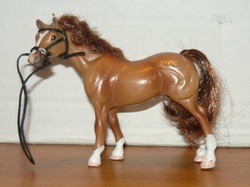 Arathi-1994 chestnut Trakehner. Sired by Onassis (r), out of Abilen by Gibertus (r). Avalanche-1996 bay Trakehner. Sired by Onassis (r), out of Amaranth (r). 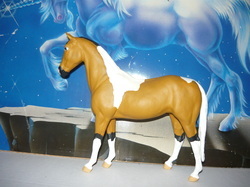 Skyrim Fall-1996 silver bay champagne American Warmblood. Sired by Good Future-r (oldenburg), out of Pegasus Of Skyrim-bso. Currently a bso. Spanish Influence-1996 dunalino. Sired by Robbi Sues Taters (r) (morgan), out of Afortunada III (r) (PRE). Santavia-2000 black Hanoverian. Sired by Santorini (r), out of Antiope (r). 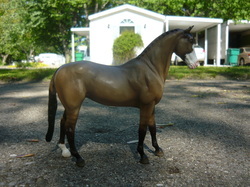 Sizzlin Wave-2001 gray (bay base) sabino American Warmblood. Sired by Popeye K (r), out of Suprecocious (r). 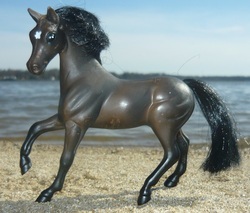 Shimmer-2001 black Hanoverian. Sired by Santorini (r), out of Garleen (r). 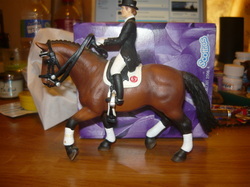 Latitude-2001 chestnut Hanoverian. Sired by Londonberry (r), out of High Pressure (r). Vodika-2003 light bay Trakehner. Sired by Chula, out of Victree (r). Bred by Shadow Wolf Stables. 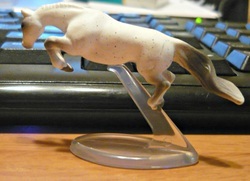 Dark Letto-2003 gray (bay base) Trakehner. Sired by Stiletto (r), out of Donaulied (r). 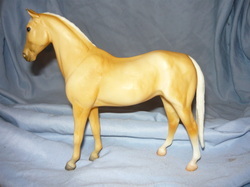 Zelda-2004 palomino Dutch Warmblood. Sired by Farrington-r (KWPN), out of Jamaica-r (Swedish Warmblood). Silence-2005 palomino Danish Warmblood. Sired by Solos Landtinus (r), out of Alino Queen (r). Azzama-2005 black Dutch Warmblood. Sired by Ub (r), out of Lindy (r). Poetry In Motion-2005 silver bay amber champagne American Warmblood. Sired by Unanimous (swedish warmblood), out of Skyrim Fall-bso. Bred with the help of Shadow Wolf Stables. Bandit-2006 bay Dutch Warmblood. Sired by Lingh (r), out of Ramona (r). Lesalle-2008 chestnut Hanoverian. Sired by Londonberry (r), out of Kleos Feine (r). Karazhan-2008 bay Trakehner. Sired by Platinum Vom Rappenhof (r), out of Kaylla (r). Frame Me A Fox-2008 palomino frame overo American Warmblood. Sired by Darrus (akhal-teke), out of Quite A Foxy Lass (TB). Bred by Shadow Wolf Stables. Ekho-2009 palomino Dutch Warmblood. Sired by Ub40 (r), out of Zelda. 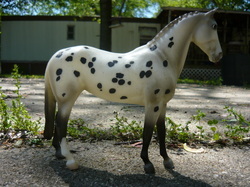 KSW Legend-2011 buckskin tobiano American Warmblood. Sired by Link (Gelderland), out of Zelda (KWPN/Dutch Warmblood). CM Jet Run done by myself. Eclipsed Luna-2013 chestnut sabino Hanoverian. Sired by Eclipsed By Color (r), out of Lorelei (r). 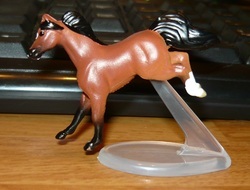 CM Schleich Hano foal done by me. Tempting Treason-2017 Grulla sabino American Warmblood. Sired by Treason (AW), out of Polar Temptress (Arab). Sire is owned by Shadow Wolf Stables. 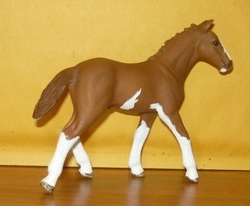 CM Breyer Classic, Jet Run, #685, added a sabino blaze.